About 85% of all wind turbines installed on land last year -- and nearly all offshore turbines -- use a conventional drive train configuration, in which a gearbox steps up the speed of the slow-turning rotor to match that of a traditional high-speed generator. An alternative approach is to employ a slow-speed generator, which although heavier and less commonly available than its high-speed counterpart, does away with the need for a gearbox, a component that has proved problematic when used in wind turbines. Use of direct drive in wind turbines is rapidly evolving and now represents a major new technology trend. A compromise between geared and direct-drive wind turbines, using a medium-speed generator, is also being tried out, although the number of wind turbines with this configuration is still limited. This year, two size records have been broken. Gamesa of Spain has introduced a huge 4.5MW turbine that is nonetheless extremely light. Its nacelle and rotor together weigh just 250 tonnes, despite a record 128-metre rotor diameter. The generator speed is just 448rpm — much lower than the 1000-1500rpm common in high-speed drive systems. Gamesa has also introduced segmented rotor blades, consisting of glass-fibre-reinforced epoxy composite inner and outer sections. The company’s new ground-assembled self-mounting nacelle crane system can exchange even a complete drive system. Gamesa says that the logistics of transport and erection of the big machine are comparable to those of some of its 2MW turbines. Germany’s Enercon holds the new power-rating record of 7.5MW, having upgraded the 6MW E-126 onshore turbine first introduced in 2007. These models are successors to the initial 4.5MW E-112 introduced in 2002, so this latest upgrade represents a cumulative two-stage rise of 67%. Both the E-112 and the E-126 models feature a giant 12-metre-diameter air-cooled ring generator. As shape retention under load is a key design driver, the output of such direct-drive generators is typically limited by a combination of thermal, mechanical and electrical loads. The 59-metre rotor blades of the Enercon E-126 comprise a 35-metre outer section made of glass-fibre-reinforced epoxy composite material, bolted on to a huge 24-metre steel inner section. The composite part features Enercon’s familiar winglet at the blade tip and has the distinctive aerofoil shape that widens towards the blade foot. By May this year, 16 E-126 models were operational. US giant GE has re-entered the global offshore wind market with a new 4MW direct-drive turbine, based on the 3.5MW ScanWind series, of which 11 units operate in coastal Norway. Like the previous models, it again features a permanent magnet generator (PMG) and an enlarged 110-metre rotor diameter. The drive system comprises a long rotating main shaft supported by two large bearings, with the upwind rotor located in front of the tower and the annular generator in the opposite position behind it. The first offshore project, using five of these 4MW turbines will be built in Lake Erie, Iowa, as early as 2012 — making it the first offshore freshwater wind farm in North America. It is likely that this model will serve as a stepping stone for GE into the offshore market. Substantially larger products are already in development and GE plans to erect an onshore prototype this year. Xiangtan Electric Manufacturing Group (XEMC) of China acquired Dutch firm Darwind’s 5MW DD115 direct-drive turbine technology in 2009. Its new turbine has a 115-metre-diameter rotor, fully sealed tower and nacelle, and single main rotor bearing. The concept further builds on a smaller 2MW product based on direct-drive technology from former Dutch turbine developer Zephyros. The renamed XEMC Darwind plans to have two DD115 turbines in the water by the end of 2010; one will be in China, with the other likely to be sited in Dutch or UK waters. According to wind industry sources, Danish Vestas and German Siemens are also developing direct-drive offshore wind turbines in the 6MW+ class, while Japan’s Mitsubishi is working on a geared 5-7MW offshore system. Chinese Sinovel plans to erect a geared 5MW+ offshore prototype turbine later this year in conjunction with US-based technology developer AMSC Windtec. AMSC is also developing 5MW+ prototypes with Korean Hyundai and Chinese Dongfang, although these are at a less-advanced stage. An increasing number of suppliers are entering the 3MW+ class in what is looking like a new wind industry trend. They are using a mix of direct-drive and geared-drive technology for these bigger turbines. Siemens is one of the world’s largest power equipment suppliers and is market leader in the offshore wind field. Its 3.6MW turbine, now available with a 120-metre rotor, is currently the most powerful in the 3MW+ class. Based on this highly successful geared model, Siemens erected a 3.6MW concept turbine in 2008, removing the original gearbox and generator and inserting a direct-drive PMG into the otherwise unchanged machine to see if a direct-drive system offered cost or reliability advantages. The company clearly found such advantages because, little over a year later, it erected a brand new 3MW direct-drive prototype. At the 2010 European Wind Energy Conference (EWEC) in Poland, Siemens introduced this lightweight direct-drive turbine with liquid-cooled PMG. The 6.8-metre-long and 4.2-metre-diameter nacelle is well within road transport limits. It weighs only 73 tonnes, compared with 82 tonnes for its 2.3MW geared nacelle, which has a similar rotor size. Siemens chief technology officer Hendrik Stiesdal said the direct-drive turbine offered 25% more power with less than half of the parts: "Our main target for the new machine was to reduce complexity in order to increase reliability and profitability." plans to erect a prototype this year in China, where it already manufactures a substantially modified and upgraded 900KW version of the wind turbine it inherited from Lagerwey. Enercon, a direct-drive turbine market leader and pioneer since 1992, has this year presented two new liquid-cooled 3MW direct-drive models, E-82 and E-101, building on its air-cooled 2.0MW model — now upgraded to 2.3MW. The new liquid-cooled generator offers superior cooling capabilities but retains an unchanged diameter, enabling the use of similar transport logistics and manufacturing processes. Enercon has used liquid-cooled generators in more than a hundred first-generation 3MW turbines in Canada and the Netherlands since 2008. However, in the newer models the radiator has been moved from an exposed external position on top of the nacelle and is now integrated internally in a more visually pleasing position. Production of both the E-82 series and the prototype of the E-102 is planned for later this year. E-102 series production is planned for 2011. Germany’s Repower already successfully markets turbine models in the 2.0-6.15MW range and in 2009 erected a new 3MW+ geared prototype for onshore use. Based on this product platform, this year the company introduced two new sister products: a 3.4MW wind turbine suitable for strong winds with a 104-metre rotor, and a 3.2MW version with an enlarged 114-metre rotor for low and medium wind-speed locations. Repower models are all fitted with a welded steel chassis and double-fed induction generator. Production of the 3.4MW model is being ramped up, fuelled by a major order for 44 units in Turkey. French power-engineering giant Alstom Wind, which acquired Spanish Ecotecnia has introduced a second version of its 3MW platform, with an enlarged 110-metre rotor and 53-metre blades. It is fitted with a geared drive system featuring the Alstom Pure Torque rotor-support concept, which separates rotor-induced bending moments from the rotor torque fed into the gearbox. This is claimed to deliver improved gearbox reliability and operational availability, and lower maintenance costs. Alstom is confident that the majority of its wind turbines could operate with their original gearbox for their entire 20-year design lifetime. Vestas, the world’s largest wind turbine supplier, this year erected a 3MW V112 prototype featuring a fast-speed geared (FSG) drive system with a PMG and large 112-metre rotor diameter. The company has high expectations of the new turbine model, which features a mechanical layout that closely resembles the conventional three-point gearbox support drive that was used in 2.75MW and 4.2MW models made by NEG Micon, which has since merged with Vestas. The new 3MW model is a departure from the compact, lightweight V90 3MW turbine development strategy introduced in 2003, which was once seen as the basis for producing larger models. Nordex, which became the world’s first 2.5MW turbine supplier in 2000, has launched the Gamma series — its third 2.5MW generation. Apart from a distinctive new nacelle shape, the focus was on combining proven technology with optimised detail solutions. Examples include a new cooling system located in the rear of the nacelle, improved operations-and-maintenance ergonomics, a torque-limiting yaw control system, and a modular drive layout with a maximum 50-tonne component weight. Each year companies from other fields step into the wind industry and leading German automotive industry supplier Schuler AG is one of the latest to do so. As part of a diversification strategy, Schuler is at an advanced phase of developing a 2.7MW direct-drive turbine. 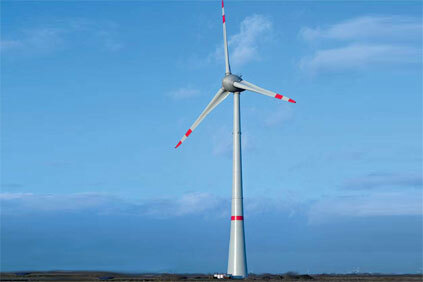 The prototype features an air-cooled PMG and a 100-metre rotor diameter suitable for medium-wind-speed inland operation. The installation will be erected this autumn for a one-year test phase. After certification, the company plans to produce a pilot series, comprising six wind turbines in 2011, with full-scale production scheduled for 2013. Another entrant in the field is Korea’s Samsung Heavy Industries (SHI), active in many areas from shipbuilding to consumer electronics. Together with renewable energy consultant GL Garrad Hassan, it has developed a conventional 2.5MW geared wind turbine, available with either a 90-metre or 99.8-metre rotor. The series incorporates a PMG and several innovative operational lifetime-enhancing features, such as improved gearbox support. SHI plans a first commercial market entry in the US this year and aims to become the seventh-largest wind turbine supplier by 2015, with a 10% global market share. SHI is also developing a 6-7.5MW offshore wind turbine and a huge 130-metre-long self-propelled jack-up-type installation vessel. Leitwind, part of Italy’s Leitner Technologies group has taken advantage of the synergies between the direct-drive ropeways it manufactures for chairlifts and such, and wind turbine technologies. This year the company was present for the first time at EWEC, although it had erected a 1.2MW prototype with an in-house PMG back in 2003 and an optimised 1.5MW prototype with enlarged 77-metre rotor in 2006. The latter is the current volume model. The family-owned company has various models up to 3MW in development and has wind turbine production facilities in Italy and India. It plans to manufacture 60 units this year. The wind industry is showing a strong drive towards innovation, combined with a focus on continuous upscaling of turbine size, as well as fitting larger rotors to existing models. These developments also clearly highlight the ongoing battle to develop the ultimate wind turbine. Indeed, the major technology trends and preferences of today may prove to be merely temporary stages in the long-term development of the industry. Wind turbine drive systems can be divided into direct drive (no gearbox) and geared systems with one, two or three stages. The main function of gearboxes is to step up the low revolutions of the wind turbine rotor to the high speed of conventional generators. Turbine drive systems. Will direct drive make gearboxes obsolete? Three-stage fast-speed systems can be found in models from about 600kW up to the Repower 6.15MW turbine. Initially they were typically fitted with four-pole generators (rated speed about 1500-1650rpm), but some suppliers have switched to six-pole generators (about 1100-1200rpm) for larger models. As larger turbines fitted with bigger rotors turn more slowly, the gearbox has to overcome a larger speed difference. That, in turn, explains the increasing interest in one- and two-stage medium-speed gearboxes with a reduced total gear ratio for turbines of 4.5MW and above. Corresponding generator speeds are about 150rpm (one stage), and 400-450rpm (two stage). Medium-speed hybrid systems with single-stage gearboxes were first applied in the 5MW Multibrid M5000 (now Areva Wind) and 1MW Finnish Winwind WWD-1 turbines in the early part of this decade, and both incorporate patented Multibrid technology. Industry sources suggest that Winwind’s later 3MW WWD-3 model features a two-stage gearbox. A single-stage gearbox offers a mass saving compared to a two-stage gearbox, but slower-turning generators are heavier due to higher quantities of copper, structural steel and magnetic steel required. On the other hand, a simplified gearbox may enhance reliability with reduced mechanical losses. Several other drive-system solutions have been developed in recent years, enabling a variable rotor speed and a fixed generator speed combination, which allows for a direct generator grid connection. Examples include mechanical-hydraulic drive systems, such as Voith Windrive, variable speed mechanical gearboxes like IQgear, the Artemis high-pressure oil-hydraulic transmission, and AMSC Windtec’s superGEAR. In direct-drive systems, the rotor and generator speeds are identical. Enercon has dominated this segment since 1992, but Goldwind of China has become a major player. But whereas Enercon successfully uses in-house generators with electrical field excitation, almost all new entrants and established suppliers choose permanent magnet generators (PMGs), which are compact with similar power rating and superior partial-load efficiency. Conventional machines, on the other hand, enjoy an additional control variable, and the manufacturing process can be more straightforward. A potential PMG-related threat is that up to 95% of the rare earth materials used for the generator rotor magnets originate in China, leading to concerns about long-term supply. One 5MW direct-drive turbine could contain one tonne of such materials. There is also strong competition for rare earth materials, notably neodymium-iron-boron (NdFeB), from other hi-tech applications, such as hybrid vehicles. AMSC Windtec is working on a 10MW direct-drive concept with a high temperature superconductor (HTS) generator, named SeaTitan. The main potential benefit of HTS generators is the elimination of the need for rare earth materials. The company says that applying high temperature superconductor technology rather than copper windings also boosts tolerances and means that generators can be lighter and more compact. HTS generator application is new for the wind industry, but superconductors are already used, for example, in ship propulsion motors, power cables, MagLev (magnetic levitation) high-speed trains, transformers and for defence purposes.